The Nudged Elastic Band (NEB) method allows for finding saddle points and minimum energy paths between known conformations. The method optimizes a number of intermediate images along the path by finding the lowest possible energy for each image while maintaining equal spacing between neighboring images. This constrained optimization is done by adding spring forces. The NEB method can be used, for example, to determine transition paths between already obtained structures corresponding to local energy minima (obtained using, e.g., the FIRE minimizer). 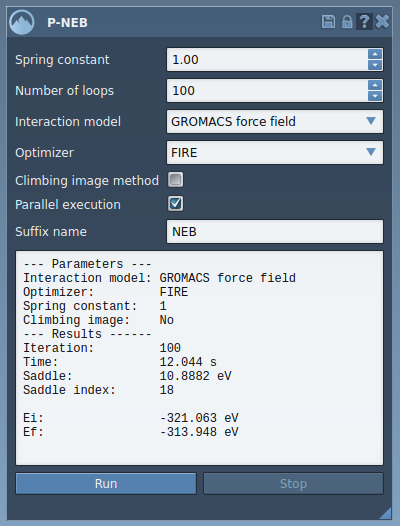 The P-NEB app implements the climbing image nudged elastic band (NEB) method (G. Henkelman, B. P. Uberuaga, and H Jónsson. “A climbing image nudged elastic band method for finding saddle points and minimum energy paths.” The Journal of Chemical Physics 113, 9901 (2000). http://dx.doi.org/10.1063/1.1329672). The P in P-NEB stands for ‘Parallel’, as the implementation is able to take advantage of multiple CPU cores. Before starting the tutorial, please download the P-NEB sample archive (~20 MB) which contains files for this tutorial. Before we begin, let’s recall that conformations are SAMSON nodes that store the positions of a selected group of atoms. Conformations are created by selecting atoms and pressing “C”. If atoms are moved, double-clicking on the conformation in the document view restores the saved positions. Similarly, paths are SAMSON nodes that store trajectories of a selected group of atoms. Paths are typically created by apps. Double-clicking on a path in the document view starts / stops moving atoms along the path. Launch SAMSON. Load 1pv7_ligand_complex_paths.sam. It will open a structural model of Lactose permease with its ligand Thiodigalactosid. In the Document View (if you do not see it, enable it in the Window menu, or press Ctrl+1), you can see the protein under the name Protein_chain_A and the ligand under the name TDG as shown in the picture below. Also, you will see several paths and a set of conformations representing ligand unbindings pathways. The goal of this tutorial is to improve these ligand unbinding pathways by applying P-NEB to them. The P-NEB app can be applied to both a path and a set of conformations. Note: if you want to apply P-NEB to determine a path between two relaxed states of a given system, you first need to generate a sequence of conformations between them, for example with linear interpolation, or with other SAMSON Elements. Open the P-NEB app by clicking on its icon . You can also find it in the App > All menu. Spring constant: the spring coefficient. Enter 1.00. Number of loops: the number of optimisations of the transition path. Enter 100. Interaction model: the interaction model (force field) used to compute energies and forces. Select “GROMACS force field”. Optimizer: the algorithm used to optimize the transition path. Select “FIRE”. Climbing image method: if checked, the P-NEB app will use the climbing image strategy to find the saddle point. Leave this box unchecked for now. You can try again later with the box checked. Parallel execution: if checked, the P-NEB app will run in parallel (one thread per conformation). Check this box. Suffix name: the suffix used to name the final path or the set of generated conformations. Enter “NEB”. 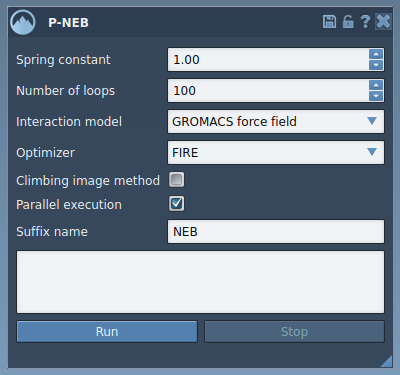 As noted above, the P-NEB app can be applied to either paths or groups of conformations. 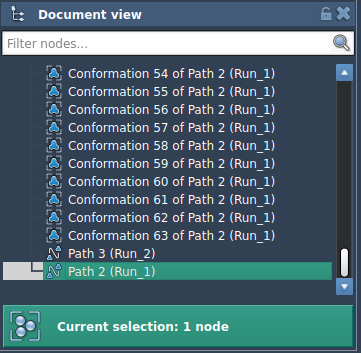 In the Document view, select Path 2 (Run_1). Then, in the P-NEB app, click on the Run button. The GROMACS force field setup will then ask for the topology file for the protein-ligand model. Click Browse and choose to open the file 1pv7_ligand_complex_topol.top provided with the structural model file. Keep the rest of the information in the window intact (see the figure below) then click OK.
Then P-NEB initialization and computation will start. You may now select the new path in the document and examine it with the inspector (Ctrl / Cmd + 3). You can also double-click the path to start and stop its animation. Note: for the same system, the creation of a set of conformations is slower compared to the creation of a path (consisting of the same steps). This is because each conformation has to maintain some information on the corresponding atoms. Therefore, applying P-NEB to a set of conformations will take longer than directly applying P-NEB to a path. 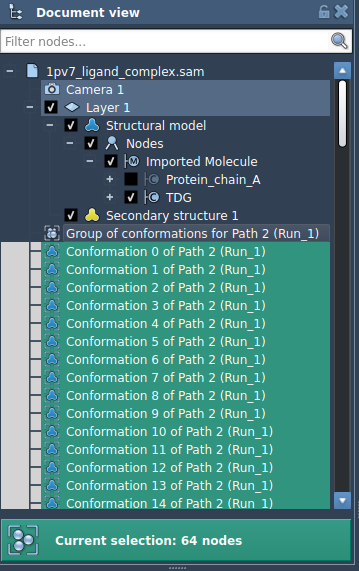 In the Document view, select a set of conformations by double-clicking on the Group of conformations for Path 2 (Run_1). This will select all the conformations in this group (this is a convenience, you could also select all the conformations yourself). Then, click on the Run button in the P-NEB app. As above, the GROMACS force field setup will then ask for the topology file for the protein-ligand model. Click Browse and choose the file 1pv7_ligand_complex_topol.top provided with the structural model file. Keep the rest of the information in the window intact (see the figure above) then click OK.
You can double-click these conformations to modify the corresponding atoms positions in the document.